Green: Means UP. 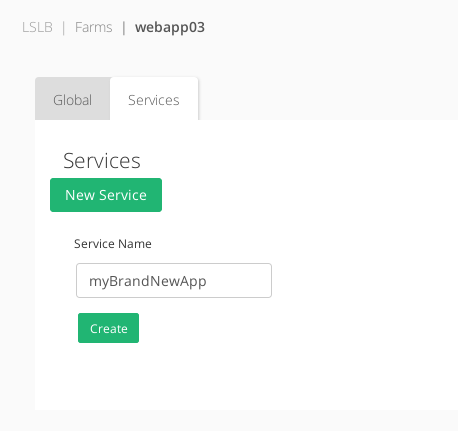 Farm is running and all backends are UP. Red: Means DOWN. Farm is stoped. Orange: Means RESTART NEEDED. There are recent changes that need a farm restart to be applied. Blue: Means PROBLEM. Farm is running but at least one backend is down. Yellow: Means MAINTENANCE. Farm is running but at least one backend is in maintenance mode. Ignore 100 Continue. If checked, the 100 Continue property will be disabled. According to the HTTP 1.1 protocol, when this header is sent, the form data is not sent with the initial request. Instead, this header is sent to the web server backend which responds with 100 (Continue). 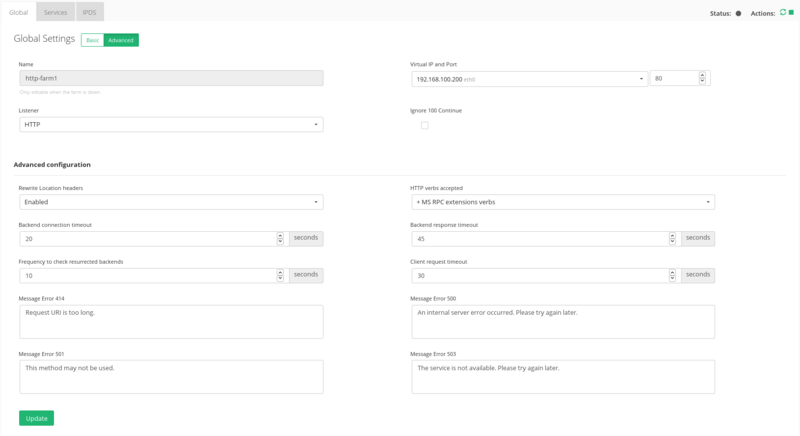 This means that the server has received the request headers, and that the client should proceed to send the request body (in the case of a request for which a body needs to be sent; for example, a POST request). If the request body is large, sending it to a server when a request has already been rejected based upon inappropriate headers is inefficient. To have a server check if the request could be accepted based on the request’s headers alone, a client must send Expect: 100-continue as a header in its initial request and check if a 100 Continue status code is received in response before continuing (or receive 417 Expectation Failed and not continue). On the other hand, some HTTPS Parameters can be found below. 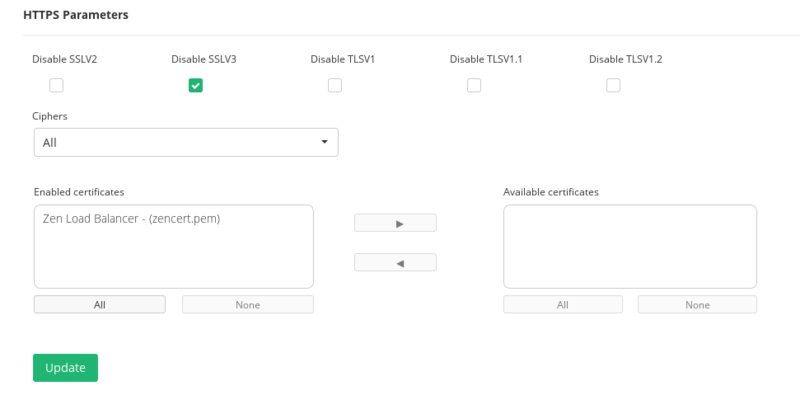 The Disable SSLV2, Disable SSLV3, Disable TLSV1, Disable TLSV1.1, Disable TLSV1.2 selectable buttons, if selected, avoid using those given protocols. Thus, once a protocol is disabled, it’s ciphers will also be disabled. Ciphers. This field is used to build a list of ciphers accepted by SSL connections in order to harden those connection. Before a client and server can begin to exchange information protected by TLS, they must securely exchange or agree upon an encryption key and a cipher to use when encrypting data. Further information about security can be found on external resources such as Wikipedia. In order to make use of ciphers please select one of the following options. Custom security. This option allows to set your own allowed ciphers through the Customize your ciphers field..
SSL Offloading. Note that Enterprise Edition v5.1 includes new SSL Offloading capabilities which increases performance on CPUs AES compatible. If your hardware implements this capabilities this option will be shown. Other wise not. Available certificates. These are the available SSL certificates installed in the device. To enable one of them you could either select the certificate and press de arrow button or you could simple drag and drop it from the Availble box to the Enabled box. Drain Mode. Keeps established connections and persistence if enabled, but will not admit new conections. This section let you enable IPDS rules. The list shows different types of protection and a select box to enable them. For further information please go to the IPDS Black List, IPDS DoS or IPDS RBL specific documentation. Action button permits to Add a new Rule as shown in next image. It also allows to “Unset”, “Enable” or “Disable” a given rule. When you unset a rule is removed from the rules list associated to the farm. The enable or disable actions makes the rule up and running or stop it respectively. After selecting the rule to be applied you will see a screen like next one. There it will appear your new rule asociated to your farm. Initially the Status of the rule is “Down”. In order to activate the rule you need to press the green “play” triangle under Actions column. It will prompt a message announcing the rule is activated. Check out our video to know how easy is to configure a HTTPS redirection with Zevenet.